Dr. Laura Eastman has created a calm, elegant physical space in which to practice medicine. When the environment is calm, the mind and spirit can soar, and true creativity can flourish. It is this creativity that Dr. Eastman draws upon to see her patients clearly and with compassion. She is inherently curious when it comes to supporting each person physically, mentally, emotionally, and spiritually. Dr. Eastman developed her passion for naturopathic medicine when she was given a homeopathic remedy that changed her life. She was in a serious car accident when she was an undergraduate student doing medical anthropology research in Liberia, in the western part of Africa. She sustained a fracture to her head, which left her permanently blind in her right eye. She went through months of reconstructive surgeries, and while she was thankful for her wonderful surgeon, she sensed there was more healing to do but wasn’t sure how to get there. It wasn’t until she happened upon an ND specializing in homeopathy that she realized what true healing could be. Since that time, she has moved toward helping other people find a similar level of deep and true healing. Dr. Eastman is a 2005 doctoral graduate of Bastyr University in Kenmore, Washington, where she was humbled to be voted by her peers as “Most True to the Medicine.” Upon graduating, Dr. Eastman was awarded one of the few residencies in the profession, receiving thousands of hours of training in naturopathic family medical practice at Emerald City Naturopathic Clinic with Dr. Molly Linton. With the compassion and cultural perspective that comes with an undergraduate degree in Anthropology from Bard College, Dr. Eastman helped to establish a low-income clinic during her residency. She saw first-hand how a low-income naturopathic clinic can be fiscally sustainable, as well as how everyone can benefit from a naturopathic medical approach to health. She brings this same vision to Tilia Natural Health. During her five years of training as a Resident Physician, Dr. Eastman was exposed to a wide variety of patients, refining her ability to see the whole person and the root cause of disease. She also developed sophistication with the energetic techniques of homeopathy, UNDA drainage remedies, craniosacral therapy, and visceral manipulation, and finds that they are an integral part of her family practice. Dr. Eastman lives in the Crown Hill neighborhood of Seattle, in a tiny house with a big, lively yard with her baby Hazel and their two cats. She enjoys gardening, reading, hiking, and traveling. She continues to eagerly learn from her friends, colleagues, and patients about all matters of body, heart, and mind. Dr. Eastman is Chief Medical Officer and owner of Tilia Natural Health, which she founded to provide a health mecca for the greater Seattle community. Dr. Eastman recognizes that community is a vital part of one’s health and invites you to visit Community and Links to learn about other community resources. 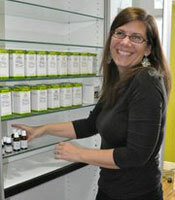 To this end, she is a member of both the national and state naturopathic associations. Dr. Amy Wells has moved to Ballard Natural Medicine, 5470 Shilshole Ave NW, Suite 300, Seattle WA 98107 (206) 632-2154.